A mango martini is a fresh, tropical take on the traditional martini cocktail. It's easy to make, and there are many delicious variations of this beverage. The classic mango martini recipe includes vodka, triple sec, lime juice and, of course, mango juice. You'll need one part mango juice, one part triple sec and two parts any unflavored vodka. You'll also need the juice from half of a fresh lime. Add all the ingredients to a martini shaker filled with ice cubes. Shake the drink until it's cold. Strain it, and serve it in a martini glass. Chill the glass in the freezer before serving your martini. Use fresh mango juice when possible, ideally with pulp. Take it a step farther by making mango puree to intensify the flavor of your cocktail. Try a premium orange liqueur, like Grand Marnier, rather than triple sec. Don't over shake your cocktail to avoid diluting it with melted ice. If you're looking for a slightly healthier cocktail, the addition of mango works well. Mangoes are known as superfoods. They contain several vitamins, including A, B, C and E, and they are high in antioxidants. Mangoes are also high in iron and low in carbohydrates. Add a little chili paste for a spicy take on this cocktail. If you aren't a fan of super sweet cocktails, add a small amount of vermouth. 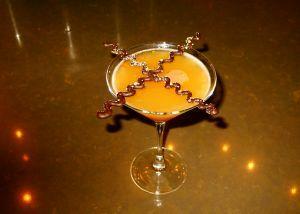 Instead of using orange liqueur, try apricot or pineapple liqueur or juice. Consider a splash of ginger syrup for a special kick. Make your own by cooking fresh pieces of ginger with sugar and water over medium heat, and then strain out the pieces. If you're not a fan of vodka, try making this cocktail sweeter with rum. If you prefer your martinis on the rocks instead of straight up, shake your mango martini and then pour it into a rocks glass with with ice. Add a splash of seltzer water. On hot summer days, blend up a frozen version of this cocktail. Simply combine the ingredients with crushed ice in a blender. Make a non-alcoholic mango martini by replacing the vodka with either seltzer water or cranberry juice. The most popular garnish for this martini is a fresh piece of mango that you can enjoy along with your drink. However, consider using one of these garnish options if mangoes aren't in season. Make your martini sweeter by dipping the rim of the glass in flavored sugar or cinnamon. Cinnamon is a great complement to mango. Place fresh blueberries in this orange cocktail for a pretty look. Use a dried chili pepper to garnish the spicy version. Place a wedge of fresh pineapple on the glass for a festive addition. Float lemon or lime zest in the drink for a modern twist. Add fresh mint leaves to give your cocktail a kick. Mango cocktails pair well with both Indian and Thai food. The lingering burn of spices is counteracted by the soothing mango juice. A mango martini is also the perfect drink to serve at a summer barbeque because it pairs well with sweet sauce. Consider serving mango martinis in the morning since they are a close relative of the mimosa and the vodka screwdriver.